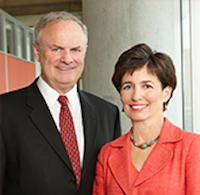 Nonprofit Connect, an organization that links the nonprofit community to education, resources and networking, named Terry and Peggy Dunn its 2016 Volunteers of the Year for their far-reaching civic leadership and volunteerism across countless organizations in our community. Terry served on KCU's Board of Trustees for two terms and was chairman from 2009 to 2013; he is currently the University's Centennial Campaign Co-Chair. Peggy has served as mayor of Leawood, Kan., since 1997 and continues to work in numerous leadership and volunteer roles. The Dunns will be honored at the 2016 Philanthropy Awards Luncheon on May 20 (learn more).